Artful way of nuancing, attention to detail, passion for rediscovering well known and lesser known compositions and linking them to modern life – all these attributes distinguish Ragna Schirmer, who won the International Bach Competition Leipzig in 1992 and 1998 and made her album debut with Bach’s Goldberg Variations. In 2009, she obtained her second ECHO Klassik award for her recording of Georg Friedrich Handel’s piano suites, and in 2012, she was awarded the Handel Prize of the city of Halle. 15 first prizes and special awards at national and international competitions are visible proof of the pianist’s impressive career. Ragna Schirmer is also a dedicated teacher. 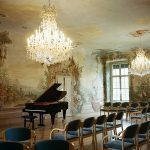 After being appointed professor at the College of Music and Performing Arts in Mannheim at the age of 28, she teaches high talented young pianists at the Musical Department of the “Latina August Hermann Francke“ in the city of Halle an der Saale since 2009. Ragna Schirmer gives concerts in the important concert halls in Europe, China, New Zealand as well as at renowned festivals such as the “Heidelberger Frühling“ (artist in residence 2010), the Salzburg Festival, the Beethovenfest Bonn, the MDR-Musiksommer, and the Haydn Festival Eisenstadt. She has performed together with Zubin Mehta, Sir Roger Norrington, Kurt Masur, Sir Neville Marriner, and Herbert Blomstedt, to name only few, and with orchestras such as the Munich Philharmonic Orchestra, the German Symphonic Orchestra Berlin, the Orchestre National de France, the Gewandhaus Orchestra Leipzig, and the Academy of St. Martin in the Fields.